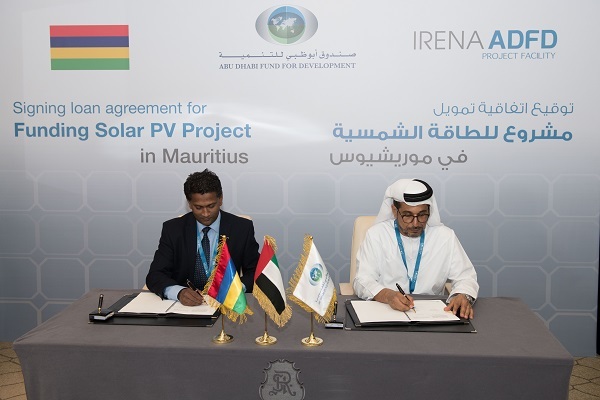 The project aims to provide 10,000 solar PV kits to low-income communities and is being financed through the Irena/ADFD Project Facility as one of the beneficiaries of its fifth funding cycle, remarked Mohammed Saif Al Suwaidi, the director general of ADFD, after inking the deal with Muthusamy Naidoo, the chairman of the Central Electricity Board of Mauritius, at the ninth session of the Irena Assembly that is currently underway in Abu Dhabi. Established in 2013, the seven-cycle facility offers $350 million in concessional loans from ADFD to help developing countries access low-cost capital for renewable energy projects. "ADFD’s funding mechanisms are designed to foster sustainable development in key sectors that stimulate economic growth and elevate living standards in developing countries. To deliver on that promise, the Fund views the advancement of renewable energy as a top priority," noted Al Suwaidi. "We are proud to work together with the Mauritian government to bring this crucial solar PV project online. The venture will go a long way in supporting the local economy and achieving national priorities, in addition to generating jobs and improving livelihoods," he noted. In October 2018, a technical delegation from ADFD visited Mauritius to review the feasibility of the project, its technical integrity, and its compatibility with the country’s strategic and development priorities. The visiting delegation also consulted the relevant authorities and assessed the sustainability of the project and its various implementation stages. The funds will enable the Mauritius Central Electricity Board to install solar PV systems on the rooftops of 10,000 households as part of the government’s efforts to alleviate poverty, said the statement from ADFD. The project will contribute to achieving the national target of integrating 35 per cent of renewable electricity into the country’s energy mix by 2025, it added. Commending ADFD for its role in supporting the national priorities outlined by Mauritius, Naidoo said: "In collaboration with ADFD as a strategic partner, we will improve access to electricity for our population and meet important government objectives." "During the lifespan of the project, an estimated 10,000 families in low-income communities will benefit from $8.3 million in electricity bill savings. The project will bring 10 megawatts of renewable energy capacity online, mitigating 143,000 tonnes of carbon dioxide emissions annually and enhancing the country’s energy security," he stated.